on the length of the movie. 1. Make sure AnyDVD HD is loaded. 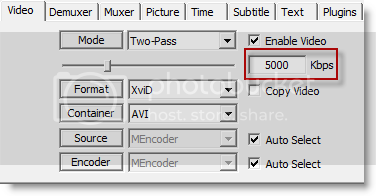 AnyDVD HD should be able to decrypt the disc. 3. Now load BDInfo and click 'Browse', select your Blu Ray drive and click 'OK'. cover of the Blu Ray. Sometimes the longest movie is the main movie with director commentary. file. In that case you could use 'tsMuxeR' to rip the movie file directly from the disc. They never make it easy though. names. This is where the playlist comes into play. Also note that the playlist file can also have a random name. the PLATLIST folder. Double click the playlist that we noted in BDInfo. are not always in order. Also make sure you have the correct language selected. 7. 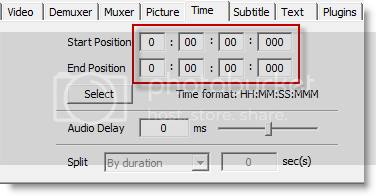 Untick all the tracks except the audio and video tracks as indicated by the red rectangle. by the orange rectangle and tick the box 'Downconvert ....' as highlighted by the dark blue rectangle. 9. Now select 'M2TS Muxing' as indicated by the light blue rectangle. 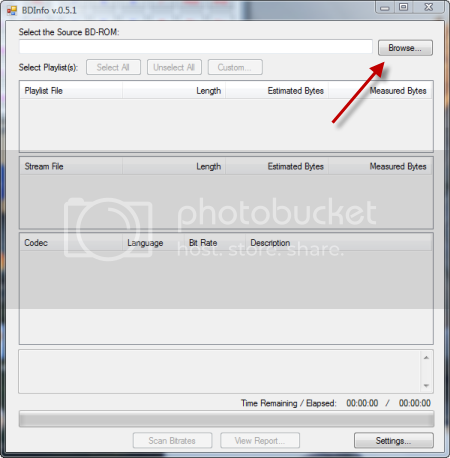 Blu Ray movie, enter a name and click save. 11. Now click 'Start', highlighted by the red arrow. OK this will take 45mins + to dump to the hard drive. 12. Once the movie has finished close 'tsMuxeR'. 13. Now the magic starts. Load MediaCoder. 14. Click the 'Add' button on the toolbar, then 'Add File'. Browse to where you saved the ripped Blu Ray and open it. 15. Now under the 'Audio' tab, tick the highlighted boxes. 16. 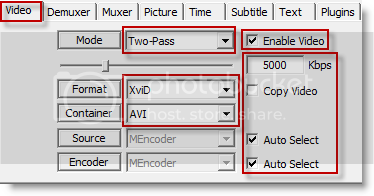 To re-encode to an XviD using the AVI container tick and select as indicated below. 17. 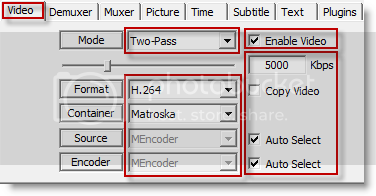 To re-encode to H.264 using the MKV container tick and select as indicated below. 18. Ok now we need set the resolution of the output. 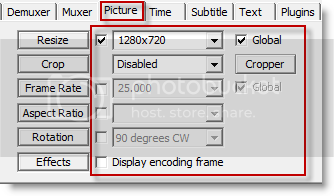 Click the 'Picture' tab and set the options as follows. 5min and end to 10mins as highlighted below. black screens, which compress more than the movie proper. 2hrs 11mins 13secs = 131mins 13secs. As it's less than 2.5hrs we will want the resulting size of 4.38GB. 4.38GB * 1024 = 4485.12MB. 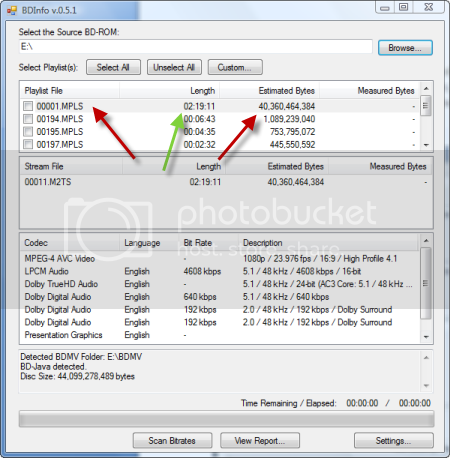 We now divide 4485.12 by 131.25 = 34.17, which is for 1min, so now we multiple 34.17 by 5 = 170.85MB. 20. Ok so now we want to start the conversion of 5mins of the Blu Ray and see what size we get. the Kbps. I would suggest differences of 100Kbps. 22. 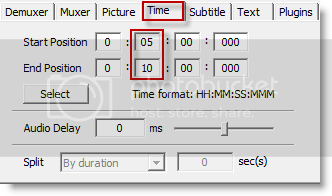 Once we are close to the 170.85MB result we want, we will set the time to 00 under the 'Time' tab and click 'Start'. wanted then play with the Kbps. Good luck and happy ripping. Feel free to make constructive criticism or suggestions. the user(s) for private, non-commercial use only. Author does not support piracy in any way, shape or form. Last edited by ladycoder on Thu Jan 15, 2009 11:05 am, edited 2 times in total. Ladycoder, this isn't spam, in fact he/she wrote to me via PM in regard to making such guide. I'll explain myself in the next post. Note to Admins: Please don't delete this. I see you changed your tune Ladycoder. That's okay, mistakes happen. You have permission to make such guide under these conditions. 1. Do not provide direct download links to rippers/converters containing codes that can circumvent any copy protection. 2. Freeware or opensource program is allowed. Shareware or trialware programs is okay as long as no link is being spammed. 3. State the name of the program(s) that will be used. 4. Post guide under Tips and Guides section of the forum. 1. Everyone speaks English here for the most part. Spell check and proof read material as best as possible before posting. 1. Pictures make guides look pretty and easy to follow for those who are visual learners. 2. 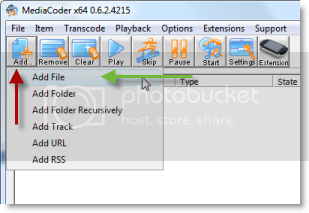 Throw in an additional guide for importing Blu-Ray movies into MediaCoder (if possible). If you're not sure how to structure your guide, you may use one of my guides referenced here as a starting point. If you have any further questions, feel free to PM me or post under the Miscellaneous section of the forum. My replay was posted to Krangath on Wednesay, January 07, 2009 @ 8:05 pm. I haven't heard from Krangath since then and haven't given much thought about it until today. Wow, what a surprise. Thank you for taking the time to write such guide Krangath. Must have taken you forever to write. Much appreciated. Oh, one minor thing Krangath. I had to change the link of AnyDVD HD to point to Google instead because AnyDVD HD contains codes that can circumvent copy protection on DVD, HD-DVD and Blu-Ray media. Nothing personal Krangath. If anyone else has a problem with this guide, please take it up with me instead. Last edited by B!ink on Thu Jan 15, 2009 1:53 pm, edited 1 time in total. I have an IT background and can usually nut most things out. In my line of work I have found most people either struggle with things technical or aren't really interested and are happy to follow step by step instructions. These type of walk through's take a while to create but I have been creating them for years so that cuts the time down quite a bit. Sorry about the AnyDVD link, duh, when you mentioned it I felt like a bit of a noob. I use the walkthrough to save my disc's as I have a number of children and have seen disc's from a disc sander in better condition than my kids leave them in. Hey B!ink, can we stick this one (just the instructions) up in "your corner" with a big thanks to Krangath? Stuck your guide under Hall-of-Fame (formerly B!ink's Corner [Essential Guides & Tips]). You guide has been sticky as well. Wow, I just hoped to help people and now my guide is a sticky and in the 'Hall of Fame'. Thanks for all your support. I'd like to transcode Blu-Ray rips to 1080p up to, say, 15GB maximum. How would you adjust settings?